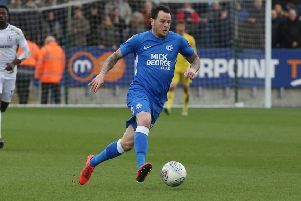 Peterborough United cruised back into the play-off places with a comfortable 2-0 win over struggling Southend United at the ABAX Stadium today (March 23). Two superbly struck long-range free kicks from Marcus Maddison won the day for Posh. The first on 40 minutes sailed straight into the net, the second in the 59th minute was parried by the Southend ‘keeper straight onto the head of Ben White who headed home. Posh played well in spells in the first-half, but took the foot off the gas after scoring a second goal. Relegation-threatened Southend failed to register a single shot on target in 90 minutes. It was billed in some quarters as a contest between two of the worst teams in League One, a claim based on current form. Southend hadn’t won in 10 League One matches whereas Posh had lost their previous three games, two against the bottom two. That might explain 10 team changes between them, six from Southend, as elusive winning formulas were sought. Posh recalled goalkeeper Conor O’Malley, captain Alex Woodyard, centre-back Ryan Tafazolli and attacking star Lee Tomlin. 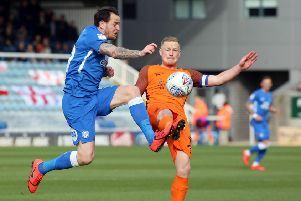 The changes prompted improvement as Posh dominated the opening half, although it took them 40 minutes to take the lead through Maddison’s superbly struck 35-yard free kick. Southend looked weak defensively throughout the opening half and Posh should have been in front on six minutes. Visiting ‘keeper Mark Oxley did well to divert Ivan Toney’s header onto the crossbar from a corner, but White really should have bundled the ball home. Posh dominated possession, looked a threat from crosses and Toney should have scored again from the deftest of passes from Tomlin, but a striker who looks bereft of confidence whacked a half-volley over the bar when he could have taken a touch. After Maddison’s goal Posh had an immediate chance for 2-0 when Tomlin combined with Toney again, but the big forward’s desperation for a goal led him to shoot from the edge of the box rather than rolling a pass to an unmarked Joe Ward. Southend were terrible in the opening half. They gave a large travelling support bussed in free from Essex nothing to cheer about. In contrast a Motorpoint Stand full of schoolkids on freebies enjoyed themselves. Toney’s frustrating day continued whene he cracked home after Tomlin’s shot had been parried by Oxley early in the second-half. An offside flag ruined his celebrations. It was a scruffy start to the second period though until Posh were awarded another free kick 35 yards out just before the hour mark. Maddison sent another swinging, swirling effort at goal which Oxley could only parry enabling White to nod home his first goal for the club. And that was pretty much that. Southend huffed and puffed without threatening Chapman, while Posh coasted while getting valuable minutes into Siriki Dembele, back in action as a substitute after a seven-game injury absence.